Over the past several months, I’ve been conspiring with MarTech Advisor’s Chitra Iyer and Amit Varshneya and industry expert Anand Thaker to produce a podcast devoted to martech news of the week. I’m happy to announce that the first two episodes of Talking Stack were released yesterday, available here. Why this podcast? 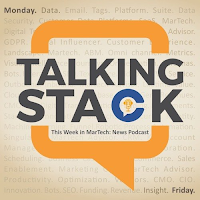 Well, there’s an awful lot of martech news every week. It’s covered quite comprehensively by MarTech Advisor, MarketingLand, CMS Wire and other industry publications. I even offer my own thoughts in the CDP Institute Daily Newsletter. But reporting the news is different from talking about it. So far, Chitra, Amit, Anand and I have had different views on the items we’ve discussed, creating a richer perspective than you’d get from any one of us alone. The round table format also forces us to be brief, creating a higher ideas-to-words ratio than you’d get in a written article, interview or panel discussion. Hopefully that translates into greater value per minute for the listeners as well. Plus, I won’t hide the fact that doing the podcast is fun. It’s a treat to talk about the industry with others who follow it as closely as I do and who share – or at least tolerate – my sense of humor. Whether we’ll repeat the silliness of the Episode 2 lead-in remains to be seen. I suppose it also depends on what feedback we get. So do let us know what you think about that and the podcast in general. We look forward to hearing from you and hope you’ll make listening to Talking Stack a regular habit.